Harwil® type Q-4 industrial flow switches are designed for extreme, long-term reliability, and for use in particle contaminated fluids. They detect and signal flow change and remain continuously adjustable while in operation. Four individual paddle options plus continuous adjustment provide a wide operating range. They maintain calibration limits when subjected to reasonable line hydraulic hammer or surge pulses. A DPDT model is available upon request. Harwil® type Q-12N & Q-12CR switches are provided with three factory adjustable parameters – paddle area, length, & stiffness – which provide performance flexibility to meet a multitude of applications. A positive stop eliminates fatigue effects of turbulence, vibration, and flow surge on flow detecting element. 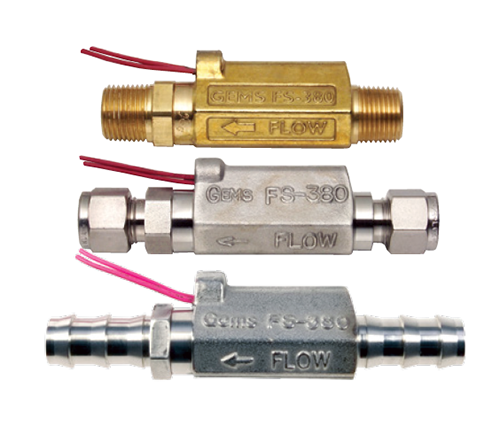 They have a very low pressure drop, typically less than 1.0psig at normal flow rate. Their small size and low profile provides easy mounting in crowded installations. Harwil® type Q-16 switches are used to signal, start, or stop electronically operated equipment when flow or no-flow conditions occur. Harwil’s patented elastomeric sealing system is superior to the metal bellows that are subject to metal fatigue and corrosion. This seal system has been field-proven for over a decade.